Bear came to Kerris Havanese when he was 6 months old and settled in exceptionally well with the Havanese crew. He wasn't so sure about the cats at first and thought that they shouldn't have the run of the house, the porch or on his crate! Bear has a very soft nature and loves his cuddles but also loves to chase Lace, who can still beat him on a flat run. It is so wonderful to be able to see them running free with their tales up high with big smiles on their faces. 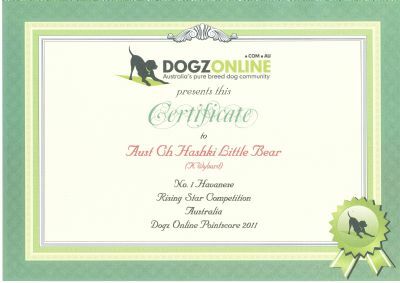 Bear has done exceptionally well in the show ring for a young dog and I look forward to his continued show career. Bear gained his Australian Championship prior to his first birthday with some very big wins along the way. What a true treasure this little boy is and a delight to show and live with. Bear has moved back in with his breeder, Hashki Kennels where he will continue his show career. His enchanting and loving ways will be sadly missed here at Kerris Havanese however we will still get to see him around the show rings.